Home Press Release AirAsia Red Hot Seat Sale is back! Promo fares from as low as P16* are up for grabs now! 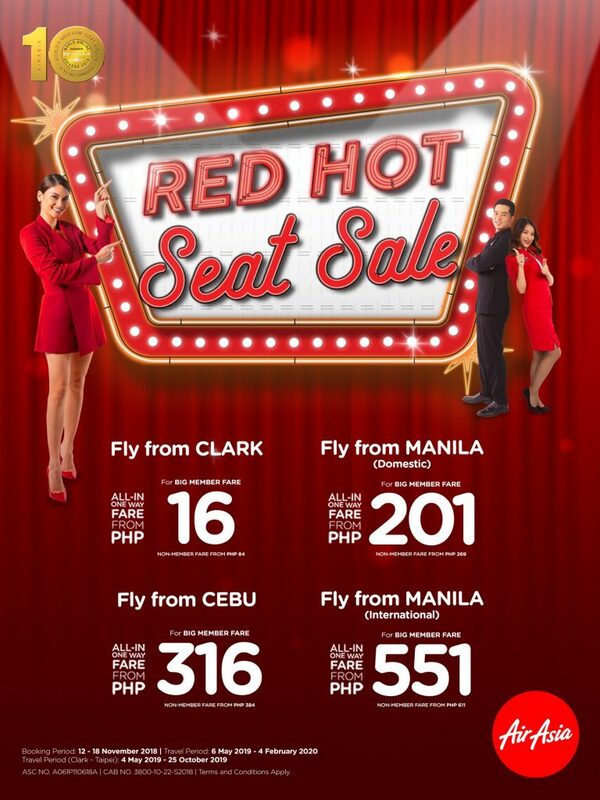 MANILA, 11 November 2018 – The final AirAsia Red Hot Seat Sale of the year is here with promotional fares from as low as P16* all-in and one way only now available at airsia.com. times in a row from 2009 to 2018. To enjoy greater benefits, guests are encouraged to sign up as an AirAsia BIG Member and get priority access to promotional campaigns, instant member discounts, seamless one-click payment and more. AirAsia BIG Members will enjoy 24-hours priority access to the promotion on 11 November 2018 (0001h GMT +8). Non-members can book our promotional seats starting from 12 November 2018 (0001h GMT +8) to 18 November 2018 (2400 GMT +8). Bookings can be made on airasia.com and the AirAsia mobile app for travel between 6 May 2019 and 4 February 2020. *Promo seats are for BIG Members only. Seats are limited and may not be available on all flights, all destinations, public holidays, school breaks and weekends. Seats exclude airport fees and other fees. A payment processing fee is applicable to all payments made using direct debit, credit, debit or charge cards. Our other terms and conditions of carriage apply. All-in fares including taxes and fees. Terms and conditions apply. Facebook (facebook.com/AirAsiaPH) and on Instagram (@AirAsiaFilipino).